Leak Repair Napa, CA | A+ Waterworks, Inc.
Home and business owners tend to have different reasons for calling a professional doing leak repair in Napa, CA. Most of the time, however, the root of their problem tends to be similar. The pressure caused by water that travels through pipes every day could eventually cause these fixtures to break. Poor maintenance could also be a reason to get leak repair for Napa, CA houses and establishments. The full-service plumbing company A+ Waterworks can address your need for leak repair in Napa, CA at once. We specialize in a wide range of residential and commercial services. Our commitment to our client’s satisfaction ensures that our work will never be mediocre. We handle projects for leak repair in Napa, CA with precision and expertise. Toilet problems needing leak repair in Napa, CA are more common than you think. Studies have shown that many Napa residential toilets have a certain degree of leaking problem. Additionally, the heavy usage of commercial toilets could lead to costly plumbing issues if not addressed immediately. For toilet leaks repair in Napa, CA, it is advisable to seek the help of a professional. Hot water heaters are more susceptible to leakage over time. A professionally done leak repair in Napa, CA can keep your water heater functioning normally all year round. Prevent accidents due to a broken water heater by hiring an experienced plumber to do leak repair service for Napa, CA homes and establishments. Among the most common sources of water leakage at home are sink pipes. Immediate leak repair for Napa, CA residential properties prevents water from ruining your cabinets and enabling mold growth. Skilled plumbers that offer leak repair in Napa, CA can fix your broken sink pipes fast and accurately. A disaster could be looming ahead of you when the water leakage occurs within the walls of your house or building. With professional leak repair in Napa, CA, you can keep your property safe from severe damages such as mold infestation. An experienced plumber can handle leak repair for Napa, CA properties, saving owners from costly mishaps. 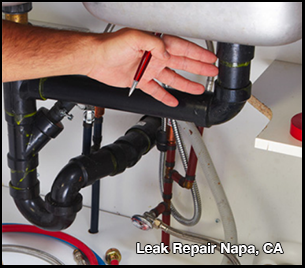 At A+ Waterworks, we offer quality leak repair service for Napa, CA home and business owners. Our team understands how frustrating it can be to try fixing damaged pipes that are prone to leak, only to find them leaking again after a while. With our quick response team, efficient methods for leak repair in Napa, CA, and reliable plumbing fixtures, you won’t have to face another broken pipe soon. A piece of real estate in Napa, CA is one of the biggest, most important assets we can acquire. Any repair or modification made to it should be of the highest quality to ensure the security of our finances. Our services in Napa, CA are available to clients 24 hours a day, seven days a week. Whether it’s a small leak in your sink at 2 in the morning, or a total overhaul of your plumbing system at a scheduled time, A+ Waterworks is ready to give you A+ service! A+ Waterworks in Napa, CA is a locally owned and operated plumbing, leak repair, fire system installation, and sanitation service company. We treat every client like they’re family and do everything we can to understand their situation. At the core of our services is empathy and passion. We specialize in a variety of residential and commercial plumbing services, and never sacrifice quality for quantity. From fixing minor leaks in houses to maintaining the plumbing system of an industrial warehouse facility, our plumbers will allot the same amount of care and attention to every project we do. A+ Waterworks in Napa, CA looks forward to creating long-term relationships with every client by ensuring customer satisfaction with every plumbing order. A+ Waterworks in Napa, CA has licensed sprinkler fitters who have years of industry experience. Our Napa team has installed fire sprinklers for warehouse facilities, multifamily housings, hotels, office buildings, and small residences in the Napa, California area. The professional installation and repair services we offer are available at reasonable rates. Drains will clog and leak over time. The accumulation of soap, hair, grease, and dirt builds up on the walls of the pipes, causing blockages in kitchens, bathrooms, and sinks, among other areas. Blocked drains are inconvenient, unsanitary, and simply disgusting. Not only do they emit an intolerable odor, but they may also cause potential harm to your family once drain pipes break. When regular drain cleaning is not enough to solve the problem, turn to A+ Waterworks for repair services in Napa! The A+ Waterworks Napa, CA team has decades of industry experience in residential and commercial sewer cleaning. Our Napa, CA sanitation experts will do everything to determine the cause of the blockages. From there, we’ll use the information we get to plan and implement actions that prevent these blocks from happening again.